Bethesda Softworks Content Manager Anne Lewis has revealed some of the ways that players can become a wasteland superhero in Rage 2 when it launches on May 14, 2019. As opposed to a traditional run-of-the-mill shooter, Rage 2 focuses on solid gunplay combined with super charged abilities, giving the player many different options when engaging in combat encounters. With plenty of abilities to choose from and a wide open world filled with sights to see and mutants to kill, Rage 2 is sure to keep players entertained for quite some time. 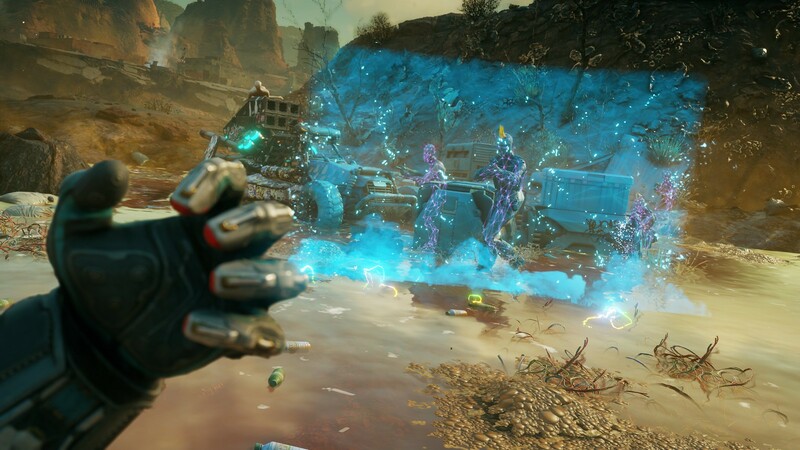 The abilities shown so far in Rage 2 include Barrier, Shatter, Slam, and Vortex. The Barrier is used for defense and puts up a holographic wall between you and your enemies. Shatter is a melee ability that will send enemies flying away from you. Slam allows you to launch into the air and slam down onto your opponents for massive damage. Vortex will pull enemies into one spot, setting them up for all kinds of different combos. Part of the fun of Rage 2 will be finding all of the various ways to combo abilities, either with guns or other abilities. Some examples of how they can work were offered. You can use the Vortex to pull all of your enemies together, then detonate them where they float with a barrage of rockets or a grenade. You can also use the Vortex to launch yourself into the air, then follow it up with the Slam ability, causing mayhem for whoever was dumb enough to stay below you. If you don’t feel like combining two abilities, why not try something simpler? Use the Grav-Dart Launcher to propel enemies into the air, then use it again to toss an explosive barrel into the group. It is safe to say that there will be plenty of combos that players can discover when playing Rage 2, and more to unlock as you progress through the game. It was explained that using combos in conjunction is the fastest way for players to fill their Overdrive Meter. Overdrive will give all of your weapons and abilities an added boost, making you even more unstoppable on the battlefield. It will also re-fill your health, so you can use it when you’re about to die to turn the tide in a fight. Will you be picking up Rage 2 when it launches on May 14th? Let us know in the comments below. Be sure to check out Rage 2‘s latest pre-order bonus!